The Islanders were a struggling franchise a decade after winning four straight Stanley Cups in the early 1980s, epitomized by their embarrassing sweep by the Rangers in the first round of the 1994 playoffs. A year later, hoping for a new start, the Islanders swapped out their distinctive logo, which featured the letters NY and a map of Long Island, for a cartoon fisherman wearing a rain slicker and gripping a hockey stick. That is the title of a new book by Nicholas Hirshon, who writes, "When today's fans and media snicker about the fisherman logo, they are largely unaware of the conditions that brought it about. The rebranding of the Islanders is worth a more deliberate investigation. In order to understand the thought process behind one of the worst rebranding efforts in sports history, the narrative must be traced several years earlier, to the greatest hockey player ever." "The NHL's uniform manufacturer, CCM, scrambled to stitch a number-99 jersey in time for the press conference in Los Angeles. All the rushing paid dividends. A month into the season Sports Illustrated called Gretzky's jersey the 'hottest piece of merchandise around.' Sales of number-99 jerseys sustained a Kings team store near the Los Angeles airport. Even in Edmonton, where many fans viewed Gretzky as a traitor and vilified the Kings, a single store sold sixty-five Kings jerseys with Gretzky nameplates in just two days. Los Angeles, which had been last in NHL merchandise sales before the trade, soared to first." The Islanders' fisherman logo debuted in 1995 and it was part of a three-season rebranding process of the Islanders, which included a new mascot, new uniforms, new players, a new coach, and a new owner that were supposed to usher in a new championship era. "In mid-1990s New York the Islanders were fighting for fans' time and money against not only the two other NHL teams in the market, the New York Rangers and the New Jersey Devils, but also professional and collegiate teams in other sports, concert halls, movie theaters, shopping malls, amusement parks, bowling alleys, and other forms of recreation. Switching the Islanders brand made their product stand out." Darius Kasparaitis and Travis Green when the uniform was introduced in 1995. Eventually, the Islanders stood out for a different reason, as the team and their legions of fans endured a twenty-eight-month span more humiliating than what most franchises witness over twenty-eight years. The Islanders thought they had traded for a star player to inaugurate the fisherman era, but he initially refused to report and sulked until the general manager banished him. Fans beat up the new mascot in the stands. The new coach shoved and spit at players. The Islanders were sold to a supposed billionaire, John Spano, who promised to buy elite players; he turned out to be a con artist and was sent to prison. We Want Fish Sticks examines this era through period sources and interviews with the people who lived it. There is a foreword from a young goaltender in that era, Eric Fichaud, who called it "one of the weirdest chapters in sports history." It took just one season for the Islanders to realize they had to make a change from the fisherman logo. Hirshon writes of the scene in April 1996, "The mounting pressure from fans, media, and former players proved too difficult to ignore. On April 4 Newsday reported that the Islanders were seeking permission from the league to ditch the fisherman logo for the upcoming 1996-97 season, which marked the team's 25th anniversary. 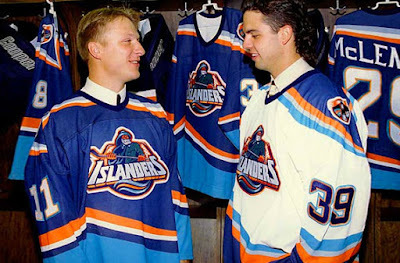 As a compromise, the Islanders proposed retaining most of the elements of the new jerseys, including the color scheme, the lighthouse shoulder patches, and the waves, while replacing the fisherman with the old Long Island map logo. the timing suggested that the team wanted to defuse the fast-approaching rally led by the Save the Islanders Coalition, which was urging fans to wear apparel with the old logo. Fans flooded the Islanders' offices with phone calls supporting the change. However, the switch seemed uncertain the next day when word came out that the league was reluctant to leave merchandisers with racks of fisherman jerseys that were about to become obsolete. The abandonment of the fisherman logo would require the unlikely four-month extension of the December deadline for teams to notify the league about a uniform change. Amid the uncertainty, Feeney said the rally would go ahead as scheduled. "On April 12 the Islanders called a much-anticipated press conference by cochairman Robert Rosenthal. 'We realize we made a mistake and we're here to admist it,' he said. 'Our fans and alumni have been heard.' To the fan base's chagrin, Rosenthal announced that the NHL had rejected the request to discard the fisherman logo for the following season. However, the league granted the Islanders permission to wear their original logo for as many as fifteen home games in 1996-97 and eliminate the fisherman entirely starting in 1997-98." The Islanders restored the the traditional uniforms, with a dark blue and orange color scheme, for the 1998-99 season, and a decade later, the royal blue and orange of the 1980s was back, but the team is still in flux, splitting games between Brooklyn and Long Island, and a new arena promised at Belmont. 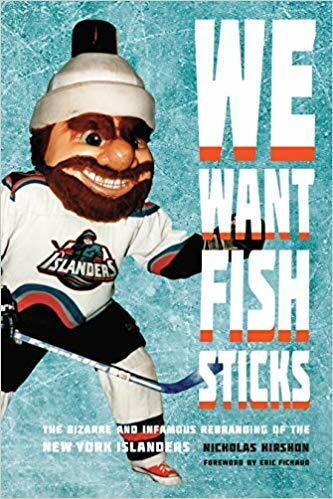 With We Want Fish Sticks, Hirshon captured what was one of the most unique stories in sports amidst what was an amazing era for hockey in New York.